Just as you care about your guests in every detail, Philips Hospitality TV cares about your Philips TVs. For the last 40 years, the company has been leading the hospitality TV industry with innovative television solutions that can be found in numerous worldwide hotel chains, sports stadiums, cruise liners, detention centres and healthcare facilities. Philips Hospitality TV’s latest generation of hospitality TVs far exceeds the industry standard for best-in-class picture and sound quality (a Philips standard). The company offers unique features, including cloud-based applications, while focusing on convenience and total cost of ownership. Philips Hospitality TV is dedicated to the highest quality standards and operational excellence, and you can see that commitment clearly in all aspects of their service. From the entrance to the hotel room, Philips offers professional display solutions that cover all hotel areas and healthcare facilities, along with practical and creative signage solutions. Philips Hospitality TV combines smart content management solutions with easy remote control features to offer you and your guests a total hospitality experience. For those who want the best high-technology equipment, choose Oxigen-powered solutions. Oxigen is the Philips standard for next-generation hospitality features. Both guests and professionals can enjoy the high-tech connectivity, whilst hotel and healthcare operators experience the lowest cost of ownership. Imagine a TV that is like a painting on the wall. 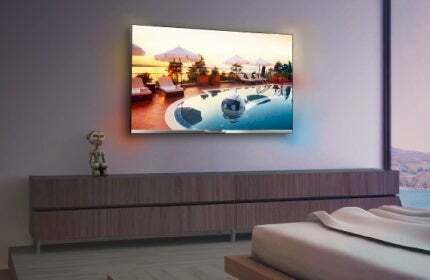 Enjoy the latest Bezel-less LED TV and the immersive experience of Ambilight, paired with a complete set of hospitality features and Philips Oxigen. Ambilight is a lighting system that actively adjusts both brightness and colour based on the picture content, which enables the viewer to see more picture detail, contrast and colour while eliminating on-screen reflections. The responsive technology is designed to intensify your guests’ viewing experience. Connect and control with Oxigen for a future-proof guest experience. Enjoy all the benefits of state-of-the-art connectivity and interactive hotel information pages while trusting that the remote installation and management will safeguard the lowest cost of ownership. With these options, users can easily customise hotel information for their guests, which can generate additional revenue by promoting your brand and service. As an additional bonus, it works in both ‘offline mode’ and ‘online mode’. Gain incredible functionality for your guests with smart hotel info pages. EasySuite’s remote installation and management features safeguard the lowest cost of ownership. EasySuite is equipped with SmartInstall properties, which effortlessly provides consistent installations and settings in all the rooms. As the tool is operated remotely, there is no need to enter the guest’s room or disturb them. Achieve greater value with energy-efficient hospitality LED TVs. You will enjoy efficient installation via USB cloning and dedicated hospitality features such as menu and control locking. With Philips Studio, you never need to choose between cost savings and a good experience. Through the use of leading technologies, Philips Hospitality TV has developed a comprehensive range of professional signage displays to create the right impression for your hospitality area. Whether you need a highly sophisticated display or if you are on a tight budget, there is a Philips signage solution for you. The range includes high-definition, high-brightness models, touchscreen and even stunning, large format videowalls. Unique features take performance to a brand new level, giving you the finest picture quality and the highest reliability even when running a network 24/7. Philips was the first brand to introduce dedicated hospitality TVs. Technology has changed a lot since then but the company's mission is still to deliver innovative solutions that benefit both guests and hoteliers. Philips Signage solutions brand licencee MMD has introduced a new line of signage displays with Ultra HD resolution, which is four times the resolution of full HD. MMD, brand licence partner for Philips Signage solutions, showcased its first Philips signage displays featuring Ambilight technology at the Integrated Systems Europe ISE fair in Amsterdam. TP Vision introduces a new range of energy-efficient Philips MediaSuite hospitality TVs. They provide great picture quality, versatile connectivity and many dedicated hospitality features, including smart remote management tools, interactive information pages and a Smart TV offering that can be individually tailored for each class of guest room. With the new generation of Philips MediaSuite TVs TP Vision presents the first range of its 2014 hospitality TV line-up. The new line-up of Philips Studio, Philips EasySuite, Philips MediaSuite and Philips Signature reinforces the company's claim to industry leadership. TP Vision presents its latest range of energy-efficient Philips EasySuite hospitality TVs targeted at hotels and healthcare facilities. The new EasySuite hospitality TVs display movies and pictures in crisp and brilliant quality with high contrast. TP Vision announces a new range of Philips Signature hospitality TVs with an emphasis on beautiful design. Frameless and featuring two-sided Ambilight, they sit well in guest rooms with stylish interiors. Signature TVs feature a complete set of hospitality features to satisfy guests' and hoteliers' needs.